Before Christmas I had a whole day visit with my pal Angie and her baby Nathan wherein Angie downloaded virtually every bit of new-mommy info she possibly could — and I gratefully ate it all up. One of her words of advice was to make a whole bunch of baby drool bandanas. You can buy these things through Amazon or Etsy, but they’re pricey. And apparently they aren’t that easily available at your usual baby shops. She said do it now, because you sure as heck won’t have time later. Advice heeded. 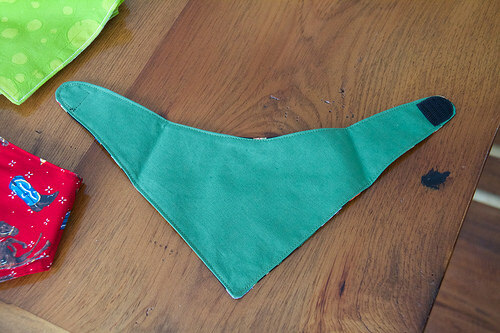 I roughly followed the tutorial offered up by Vivian at See Kate Sew, making most of mine as triangles with 11″ sides. It’s really hard to know if these are going to fit properly. They aren’t needed right away; the drooling really kicks into high gear when baby starts teething around the 4 month mark. I made a couple at the 13″ size as well but they seem rather huge. I suppose toddlers still do their fair share of drooling so I’m guessing we can make use of them all. 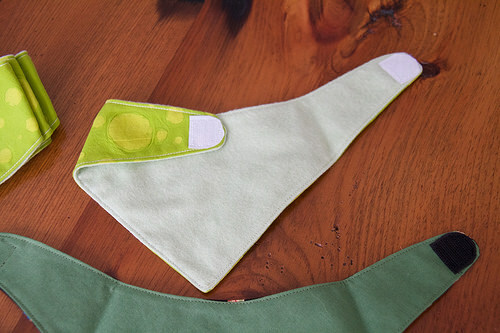 Baby Drool Bandanas, reversible, with a velcro closure. The first bunch I made were just two layers of complimentary coloured fabrics, but then I realized that they might be more absorbent if I used some flannel, so I made a bunch backed with flannel. These are ridiculously easy to whip up, and since I was reading that some people are changing them a half dozen or more times a day, having plenty on hand is a good thing, and saves having to change whole soaked outfits as often. 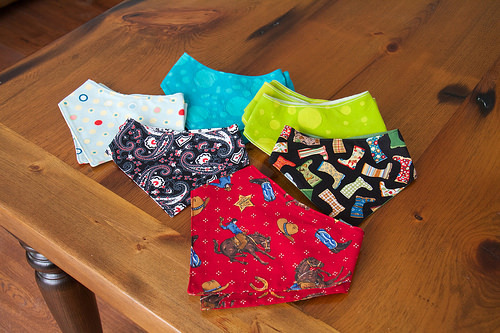 Baby Drool Bandanas, backed with flannel. Here’s to the drool days of summer… only 4 months away!